Drinking wine may be pleasing, but it could ruin your teeth. Wine can have a negative impact on your enamel, which is a film that covers and protects your teeth. According to a study published in the journal "Nutrition Research" in August 2009, different types of wine may have a more negative impact on your teeth than others. Drinking wine may rot your teeth. 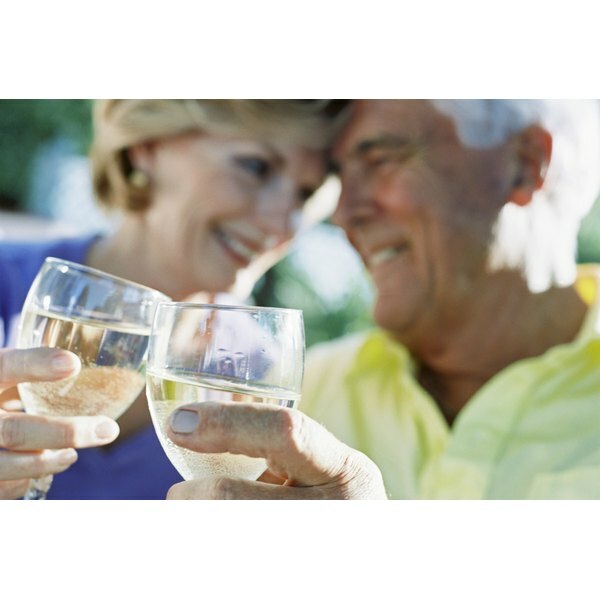 The "Nutrition Research" study tested the effects of multiple red and white wines on teeth. The study found that wine eroded the enamel of teeth, and white wine had a worse impact than red wine. Wine is highly acidic, and the acid leads to lower levels of minerals such as calcium and dental erosion. Riesling was found to be the most acidic of the wines tested in the study. Fizzy, carbonated drinks and juices may also erode enamel. Drinking wine stains your teeth, and though red wine is the worse offender, drinking white wine may not be the answer. White wine can be responsible for staining as well, says Dr. Mark Wolff of the New York University College of Dentistry in an article on the MSNBC website. White wine contains acids and tannins that may make tooth enamel more porous, causing teeth to absorb color from foods and drinks more easily. Tannins are molecules that bind to the structure of teeth. Brushing your teeth after you drink wine may actually cause additional damage, says Dr. Peter Alldritt, chairman of the Australian Dental Association's oral health committee, in an article published in March 2011 on the ABC Health & Wellbeing website. Brushing directly after drinking sugary beverages -- like wine, soda and juice -- may hurt your teeth because the enamel is soft from acid in the drinks. Eating fruit causes the same problem. Brush your teeth 30 minutes or more after consuming acidic foods and beverages; this gives your saliva time to neutralize the acidity. Avoiding wine may help reduce stains, but there are ways to minimize the damage without giving up wine entirely. An article in FNC iMag recommends brushing your teeth before dinner and putting on lip gloss. A lip gloss with a petroleum base creates a barrier between your lips and the wine's tannins. Eating cheese may also help. Cheese is rich in calcium, which neutralizes saliva and combats acid damage from wine, according to a 2009 article in the "The Independent." Can Your Teeth Be Saved if You Stop Drinking Diet Soda?